by Grown-up Travel Guide Contributor in Albania, Europe, Features, Home, Places. It’s time for entry number five in our series; to date we have shared the experiences of an Englishman in New York for the first time, then a Canadian in San Francisco, An English Lady on the Costa Brava and a Kiwi in Cambodia. A number of different authors tell us how it went the first time they visited a city or town. Did it live up to their expectations? Were there any big surprises, shocks or strange differences they weren’t expecting? Was there any truth to the stereotypes they had heard about? I’ve wanted to visit Albania since I first tried to pronounce Enver Hoxha, the name of the dictator who ruled this land for four decades. Convinced his name was Hox – Hah (it’s actually pronounced Hodge-ah) I watched as he tumbled from power, his statues following closely. I’d left it too late to sample what was once the most isolated country in the world, rejecting both China and Russia in favour of a rigid autarchy devoid of any semblance of freedoms or human rights. And then Albania’s Communist regime crumbled, a domino among the falling tiles of Soviet satellites. We were in the early 1990s and I still hadn’t been there. Chaos hit. A newly capitalist economy caught everyone by surprise and Ponzi schemes and bankruptcies on a grand scale led to social revolt in which several thousand died. The hinterlands became the badlands, so much so that the UN Security Council had to call for intervention. With the population heavily armed, safety would remain an issue and it would take years to dispel the country’s violent reputation, not aided by the Albanian crime wave that spread across Europe as the Eastern Bloc melted away. So yes, when I finally did make it to Albania in August 2012, I had expectations, had developed stereotypes, and thought I knew a lot more about the country than I actually did. I had been warned that some regions were still unsafe (they’re not) and these days it’s hard to imagine that just 15 years ago the streets of Saranda and Vlore and Gjirokaster were filled with armed gang members spoiling for a deadly fight. Other than the driving – which is improving but still erratic – I experienced no fear at all. People were at times a bit abrupt but I think a lot of that had to do with unfamiliarity. On the contrary, once the ice was broken, Albanians were quite friendly, always ready to respond to a wave and when the opportunity arose, unimaginably hospitable. I was right and wrong on this one. On the one hand the country’s larger resorts have suffered massive and rapid over-development On the other, the smaller accessible beaches are mostly pristine, with a few cafes and restaurants, although the threat of jetskis and loud music hovers nearby. 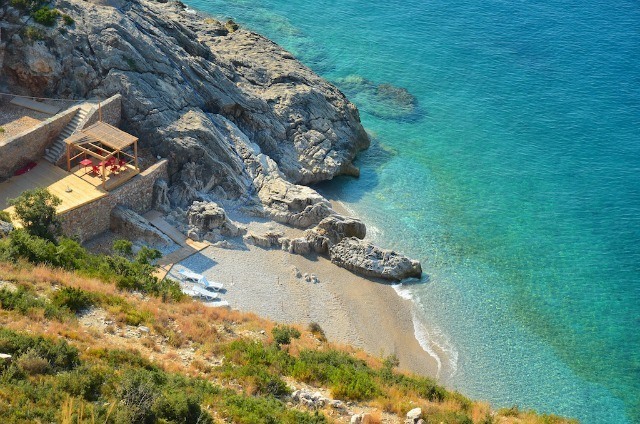 The real secret of coastal Albania is its inaccessibility. There are dozens, perhaps hundreds of tiny coves with white sands, warm crystalline waters, and not a soul in sight. You’ll have to work to get there on a sailboat or kayak – and you’ll need a guide. I had no idea. If you take the time to head off the beaten path, Albania is spectacular. Easily accessible regions are feeling the brunt of rapid tourism encroachment combined with insufficient sewage and water treatment, excessive litter, unplanned development and erosion and depleted forests. Just veer away from the crowds – thin by any standard – and you’ll discover a world of virtually uninhabited wilderness, rushing rivers, glittering lakes, deserted beaches and majestic mountains. It’s enough to take your breath away. Not at all. 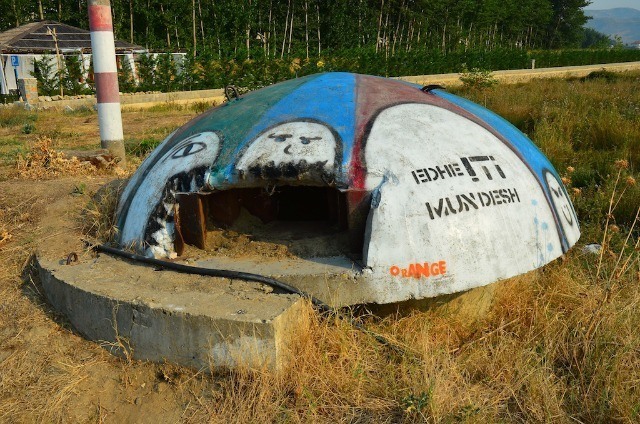 While many bunkers were destroyed, others have either been converted to new uses or abandoned. They’re not exactly pretty, but a good reminder of what once was. Certainly anything remotely linked to Enver has gone, but if Communist memorabilia is high on your list, the antique shops of Kruja have plenty of mementoes. Communist architecture, of course, is everywhere, from the dour socialist apartment blocks to the monumental public buildings. And let’s not forget the statuary in honour of Communist heroes. I’d heard about the edgy mayor and painted buildings and new skyscrapers but Tirana still feels like a small provincial capital trying to grow up too quickly. It’s old school charm doesn’t stop it from being vibrant and I’m not looking forward to the city’s major overhaul. I didn’t expect the vibrant nightlife of the Blloku, a quadrant of streets where the country’s elite once lived. 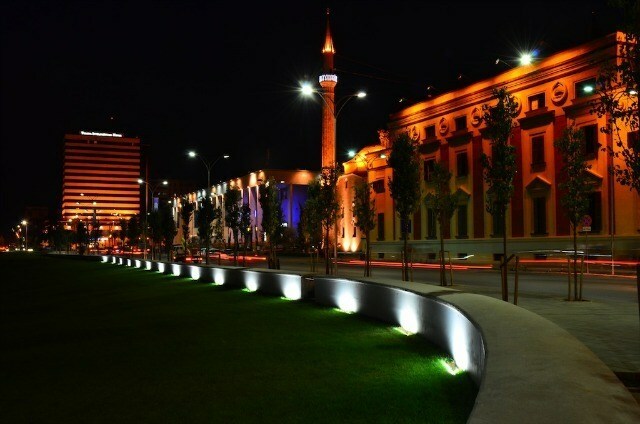 Now it is filled with excellent restaurants, galleries, bars and clubs and comes alive at night. Strangely, it’s the only part of town I experienced even a moment of unease when I ran afoul of a drunkard. Locals immediately rushed to the rescue, another example of the welcoming nature of Albania, proud and unwilling to tarnish its reputation by allowing even one man to get out of line. The majority of Albanians are Muslim and you’ll see mosques everywhere but it’s not what I would automatically call an Islamic state. There is separation of church and state and people tend to be irreverent as opposed to religious. There is a large population of Orthodox and other Christians, and there is a religiously tolerant vibe. It may be a leftover from Communism but the country definitely has an egalitarian feel, whether religion, gender or social class. This harks back to my Balkan experiences during the 1980s when Communism was at its height and foodstuffs scarce. So I was surprised to discover the Greek and Turkish influence of food here, as well as the freshness of produce. But what really threw me was the seafood. What ends up in your plate along the coast is absolutely irresistible! And no, contrary to reports by earlier visitors, the coffee is NOT bad. In fact, it’s as good as you’ll find over the water in Italy. The fact that Albania was full of Illyrian and Greek and Roman ruins somehow escaped me. 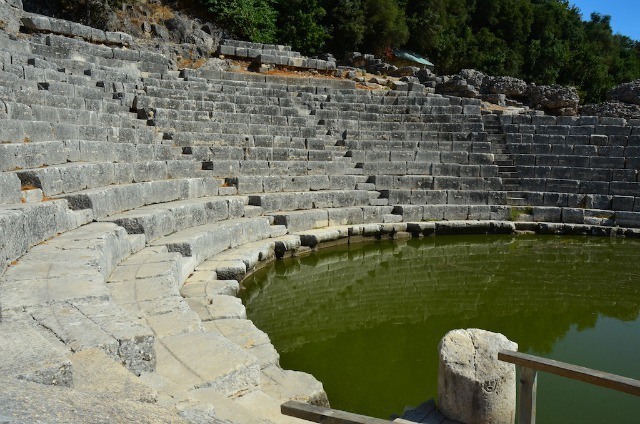 Yet one site, Butrint, is already protected by UNESCO under the World Heritage convention and another, Apollonia, should be. 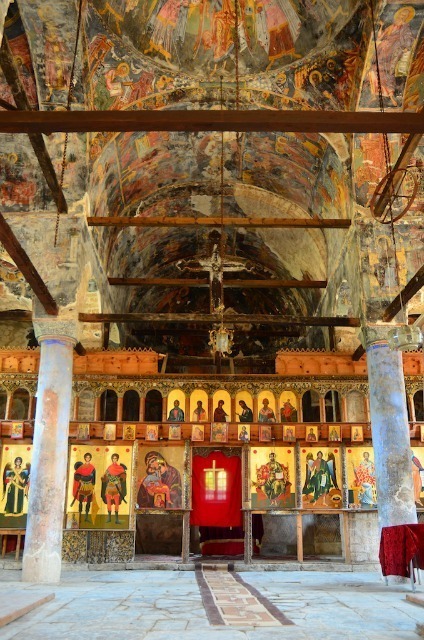 The exquisite paintings on the walls and ceilings of the churches of Voskopoje are also ruins – unfortunately – but worth some serious protection. What perhaps struck me the most was the sheer diversity of Albania, whether culturally or physically. It is very much a country in transition with a foot in each century but its people are industrious and energetic and optimistic and are rushing to embrace the future as Albania reinvents itself – not too radically, I hope, because there’s a lot worth keeping. Leyla Giray, a journalist and ex-foreign correspondent, is an international development worker based in Geneva. She has just released her first book, Women on the Road: The Essential Guide to Baby Boomer Travel, and you can connect with her on her website and blog of the same name, Women on the Road. Great article! Albania is in my top 5 countries and it is truly beautiful and unique through its landscape, history, and people! I can’t wait to return there! I just hope more and more travellers are going to head there and be amazed of it all! Great Post!! 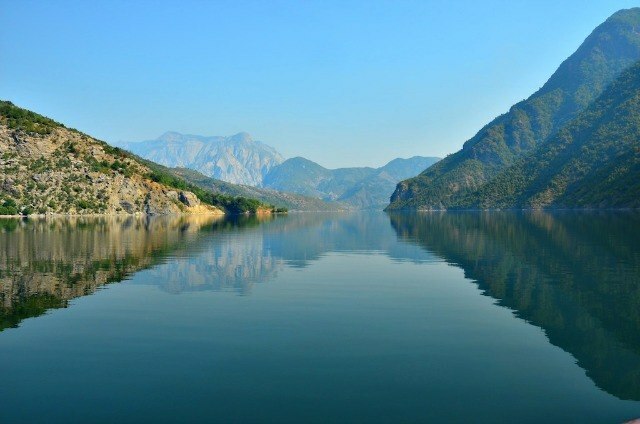 Albania is a small country but really very beautiful. I was there with my family at last month and i visited almost all destination places of this country. I want to again go there.